The last item on the list for the oscilloscope calibrator is an AC to DC power supply. I couldn't really design that earlier because I wasn't sure what supply voltage and current would be needed for the amplitude amplifier. Now I do. With the design settled on a 12VDC supply, and with some SPICE modeling, the supply needs to deliver at least 20mA. Meanwhile, a 5VDC, 0.5A supply should be enough to drive the TTL ICs. To get regulated DC power, we need to convert line AC voltages to lower AC voltages, rectify AC signal, filter the ripple, and feed it to voltage regulator ICs. 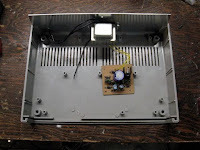 The first step is to convert a 115V, 60Hz AC signal into a much lower AC signal, 12VAC in this case, since 12V transformers are very easy to source like this 450mA one from Radio Shack for just over $6. I may upgrade to a higher capacity transformer in the near future to ensure the entire power supply can safely deliver more than enough current. Time to convert the 12VAC signal to DC. Before we can do that, we have to rectify the signal, that is, convert the negative voltage swings of the AC signal to positive swings. Typical rectifier diodes are 1N4001 thru 1N4007, each with a progressively higher voltage rating. Pick a voltage rating that is at least 2.83 x Vrms (in our case 12 x 2.83 = 34V). Hook up the diodes into a bridge rectifier topology. Or, use a bridge rectifier IC. The output from the rectifier is not DC yet. The waveform's ripple needs to be filtered using large electrolytic capacitors. Select capacitance based on the desired ripple factor or just use the rule of thumb of 1000 to 2000µF per amp. Choose capacitor working voltage with a safety margin above the peak to peak voltage of the rectified waveform. Multiplying the RMS (root mean squared) VAC by 1.414. In our case, 12VAC (RMS) has 16.968V peaks. I chose 35WVDC. So now we have a nearly pure DC signal. It's good enough for the rectifiers (whose data sheets may tell you what ripple factor you need to engineer for). We'll now use a voltage regulator to smooth out the DC and fix it fairly precisely at the desired voltage despite varying load. Linear regulators are very popular and simple to use and come in several voltages, including 5V and 12V. The LM7805 does 5V and LM7812 does 12V. We'll use each for this power supply. Linear regulators need a DC signal that is about 3x higher than the desired output voltage. The voltage difference is burned up as heat by the regulator. So if there's a big difference between the input voltage and output voltage (like 16V to 5V) a heat sink is required or we need to supply a lower voltage level to the regulator. I may end up selecting a separate 6VAC transformer. Another capacitor can be added across the regulator output to ground to provide reserve current for increased demands. Usually something like 100uF/amp is suggested. 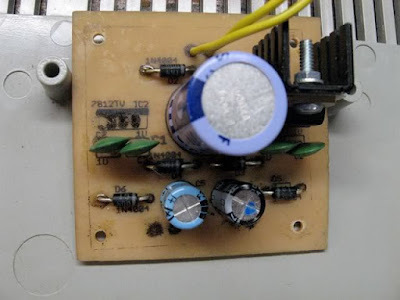 When the circuit is turned off, the charge in this capacitor will dump back into the voltage regulator. 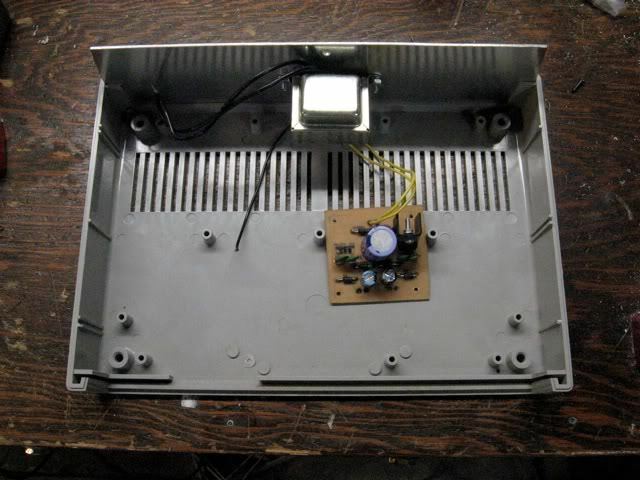 To prevent this, a rectifier diode is placed to bypass this current from the output to the input terminals. Lastly, small capacitors, 0.1µF to 1µF are placed close to the regulator body across input and ground and between output and ground, to reject noise. Use a polarized plug. This is the standard for most modern electronics to avoid shocks. To turn the power supply on and off, put a switch on the hot wire going to the primary windings of the transformer. Place a fuse inline on the hot side, between the plug and the switch. Pick a fuse that is about 2X the normal current requirement. Use a slow blow fuse. Finding out the max current on the primary side is a question of finding the ratio of voltages (120/12 = 10 in my case) and then using that to figure out the current requirement. With two 2A regulators, the primary will see 200mA; 2 x is 400mA so the next closest size is 0.5A. If I find that inrush current that charges the large capacitor causes the fuse to blow, I can always size it up a bit. Finally for surge protection, a Metal Oxide Varistor (MOV) is placed in parallel between hot and neutral, after the switch. Select one with a maximum continuous voltage of 20% more than the normal line voltage (for 115V, a 135V rating would work). So here's the finished schematic. I have to build this circuit before I can test the amplitude section, because I don't have any other 12V supplies available. I decided to try my hand at PCB fabrication for this portion of the project. Here's a picture of the rectifier / regulator board. It's almost completed. The transformer, MOV, fuse, and power connector are going to be external to this board.